I wanted to post this Kala Jamun for last Diwali itself, but as i posted so many diwali recipes last year, didn't have time to post this recipe. From my childhood i remember, for Diwali apart from other sweets and snacks, Gulab jamun will also be there. Gulab jamun mix will be in the grocery list when we do grocery shopping during diwali. The most fascinating thing will be most of the gulab jamun mix will giveaway something free along with the mix. Most of the times it will be some glass bowls. 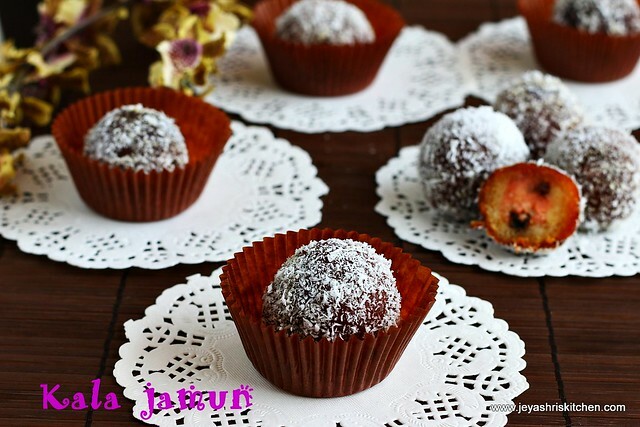 I have already posted Makan peda recipe using gulab jamun mix. So with the store bought gulab jamun mix, you don't need to make the same usual gulab jamun. 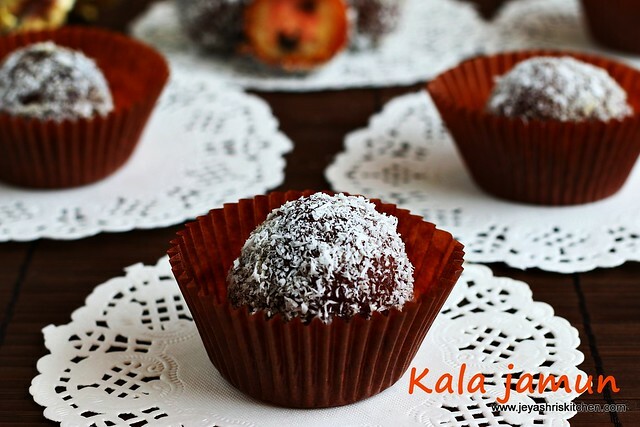 Try out this kala jamun recipe and i am sure it will be a treat for your family and guests. I have bookmarked this recipe from Vahchef video. Check out all my diwali recipes collection. Follow Jeyashri's Kitchen on Facebook for updates. *I used almonds and raisins. You can use pistas and cashew nuts too. Chop the nuts finely and keep it aside. Keep the gulab jamun mix in a wide bowl and add 1 tsp of sugar to this. Adding sugar to this gives nice colour to the jamuns after frying. Add water little by little and knead this into a soft dough. Grease your hands with ghee and knead well. Divide the dough into 2 portions by keeping aside 3/4th portion of the dough on one side and 1/4th portion of the dough of the other side. Keep the dough covered all the times. To the smaller portion,that is the 1/4th of the dough add the chopped nuts and the food colour. Divide both the dough into equal parts. The plain dough must be bigger in size and the coloured one must be smaller in size. Using greased hands make the divided dough into smooth balls. Keep the rest of the balls covered all times to avoid drying and getting cracked. Make a dent in the big jamun ball and stuff the small coloured one inside it. Cover it and make it into a smooth balls. Heat oil for deep frying. When the oil is hot, bring it to a very low flame. Slowly put the stuffed jamun balls inside the oil and let it cook in a low flame. Meanwhile you can make the jamun balls for the next batch. Keep an eye on the jamuns frying in the oil. Fry till they become golden brown. Drain excess oil in a kitchen towel. Always cook them in low flame, else inner portion will not get cooked. Let this sit for a while and fry another batch of jamuns till golden brown. Take it out from the oil. Now put the first batch of jamuns which we have already fried and taken out from oil. Keep the flame in medium low and fry till they turns very nice brown colour. You will not get any burnt smell in the jamuns. Ensure the flame is not too high. Drain excess oil in a kitchen towel. Make the sugar syrup by combining the sugar and water. Boil till the sugar melts and forms half string consistency. Switch off the flame. If adding saffron or cardamom add it the syrup now. When the sugar syrup is still warm add the double fried brown coloured jamuns into the syrup. Repeat this for the rest of the double fried balls. Actually the process of making kala jamuns ends here. I have made few enhancements to this, you can follow that if you want, else serve it as it is. After and hour take it out from the syrup and keep it in a plate. In a wide plate add the desiccated coconut and roll the kala jamuns onto it. Arrange it in a plate and the jamuns are ready to serve. This can be kept inside the refrigerator and consumed within 2-3 days. The jamuns will double in size when they are fried, so make the balls accordingly. Always roll the jamuns smoothly without cracks. Greasing your hands with ghee and rolling will smooth texture. Be patient while frying the jamuns for the first time, else the inner portion will not get cooked. 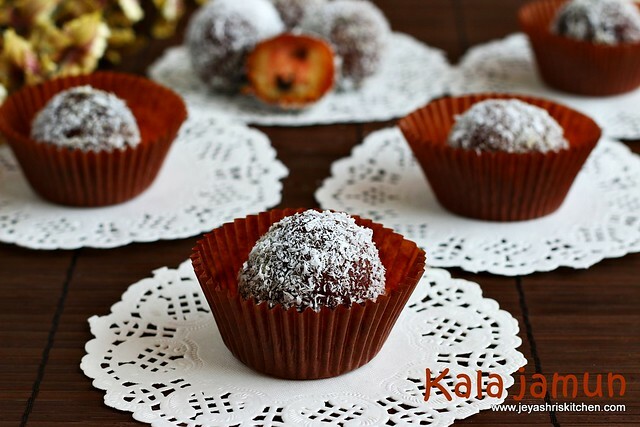 You can make the same kala jamun following my khoya jamun recipe too. Replace jamun mix instead of khoya. Which brand of Gulab Jamun did you use? Taste wise it won't make a difference. But just to differentiate it from the outer portion, we are adding colour. nuts goes inside as filling also?